The rotator cuff is a group of strong, ropelike fibers (tendons) and muscles in the shoulder. 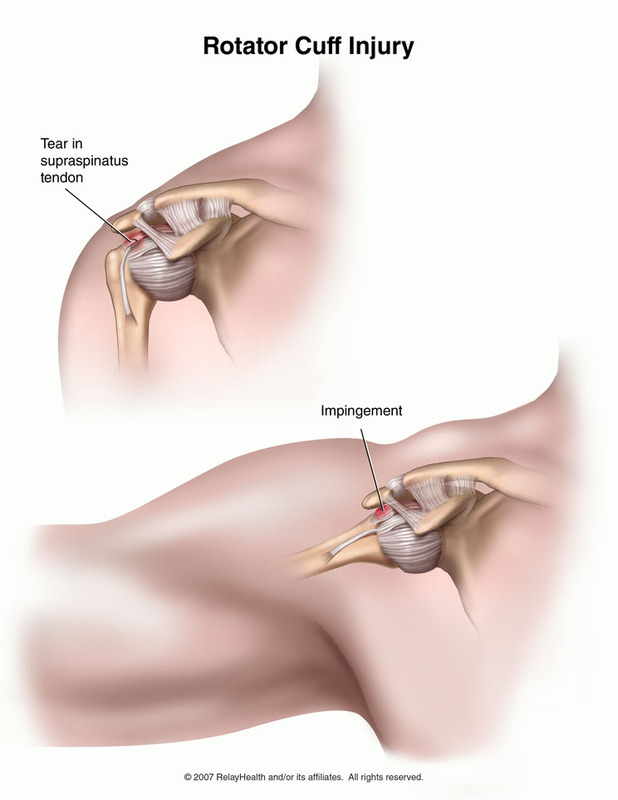 Rotator cuff injuries occur when tissues in the shoulder get irritated or damaged. The shoulder is a joint with three main bones: the upper arm bone (humerus), the collarbone (clavicle), and the shoulder blade (scapula). The bones are held together by muscles, tendons and ligaments. The rotator cuff keeps the upper arm bone in the shoulder socket and lets you raise and twist your arm. Impingement Syndrome, in which a tendon is squeezed and rubs against bone. Calcific tendinitis – a buildup of calcium in the tendons, which causes a painful condition. Normal wear and tear. Using your shoulder for many years slowly damages the rotator cuff. As you age, everyday activities can lead to changes in the rotator cuff, such as thinning and fraying of the tendons and reduced blood supply. Overuse. Activities in which you use your arms above your head a lot-such as tennis, swimming, or house painting-can lead to rotator cuff problems. Even normal motions made often over a long period can stress or injure the rotator cuff. Both normal wear and tear and overuse can lead to impingement, when a tendon rubs against bone. This damages and irritates the tendon, which causes bleeding and inflammation. Over time, scar tissue replaces healthy tissue, and the tendons become stiff, stringy, and more easily injured. It takes great force to tear a healthy rotator cuff tendon. This can happen during sports, an accident, or a severe fall. But even a simple movement, like lifting a suitcase, can cause a rotator cuff tear in an older adult or someone whose shoulder is already damaged. Taking anti-inflammatory drugs for a short period of time may treat the symptom of pain, but it will not treat the underlying rotator cuff problem and symptoms will come back. In addition to taking medications, daily stretching in a warm shower will help. Avoid activities with the injured arm, particularly activities where the elbow would move above shoulder level. Avoid repetitive motions such as vacuuming, painting, raking leaves and washing the car. Your doctor may refer you to a physical therapist who can demonstrate the exercises most effective in strengthening and stretching the shoulder muscles. If you have persistent symptoms, despite the use of oral anti-inflammatory drugs, your doctor may consider a cortisone-type injection. Cortisone is a potent anti-inflammatory medication. The doctor may also perform an ultrasound, MRI, or arthrogram to rule out a rotator cuff tear. Platelet-rich plasma (PRP) and stem cell therapy are innovative and cutting-edge treatment techniques that may help repair chronic or acutely damaged muscle, cartilage or joint problems, and help with the healing process. Platelet-Rich Plasma (PRP) therapy captures the healing growth factors that are in a person’s own blood. By injecting the PRP into the damaged area of the knee, it may help regenerate muscle and tendons, and diminish pain. In addition, there are indications for platelet-rich plasma in healing a variety of conditions, in much the same way that stem cells may be used to help regenerate different types of tissues. Adult stem cells can also be used since it contains many of the healing growth factors that are also found in platelet-rich plasma. If you continue to suffer with a rotator cuff injury and your current treatment plan leaves you feeling frustrated, perhaps a fresh set of experienced eyes can change your outlook. Since 1990, Dennis M. Lox, M.D has applied his personal interests in sports medicine, cutting-edge regenerative medicine and chronic pain management to helping patients increase their quality of life. Contact us for an appointment at 727-462-5582.